This latest algorithm update is a change to local search with apparently positive results for users and local businesses. The Possum update has placed more emphasis on the users location, meaning users get a much more accurate result. With this recent update Google are now filtering based on address and affiliation for example, businesses that fall outside the city limits had problems ranking for keywords that include the name of the city, since the Possum update these businesses now have seen a huge spike in rankings. This is going to help those local businesses who fall out of the city barriers but still want to compete in local search. For example, if you have a plumber with a primary location, but has separate listings for individual plumbers, Google is now picking the most relevant listing and filtering those out that are similar. The thing is Google does not like duplicate listings and they want to get rid of them. If you search from a different location than your business you will more than likely encounter a different result. Due to the number of people now searching on their mobile phones Google is going to change results to where the user is located at the time. Unfortunately there is not much that can be done about this apart from ensuring that your listings are optimised for your local keyword results and your pages are optimised. Another change that we have seen is that local SEO is been driven more by the user. The keywords used and how they are typed in to search engines make a big difference. You need to know and understand what you are doing with long tail keyword research as this will play a big role in local SEO. Google reviews are also important as they play a part in local search visibility having a Google My Business listing is now essential for local search. This is free to set up and this will allow you to appear in the local search results for queries related specially to your product or service. Don`t be afraid to ask your customers to review your business, you can do this when they are in your premises, via email, phone call etc. whatever works best. 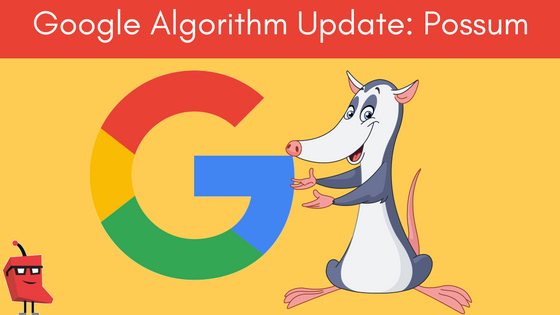 It will take time to see how the Google Possum update will play out, our advice would be to remove those duplicate listings and keep an eye on those rankings. If you feel that your rankings have been affected by the latest update and need some advice. Please get in touch with us on 353 74 912 4737 or drop us a line here.